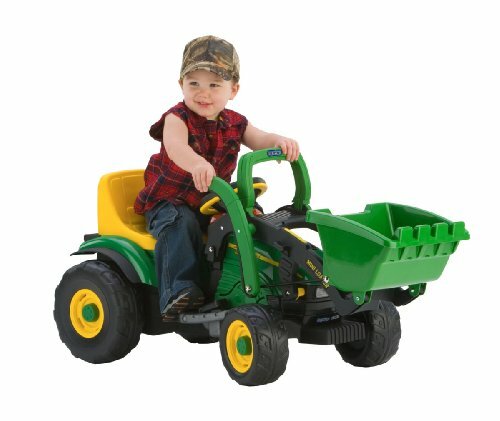 Are you having a hard time finding John Deere toys for your kids? If so, we’ve researched what the top choices have to offer and put them into a review for you. So, the hard part has been done – all you need to do is have a read through the different options below and select the one that stands out to you the most. A buyers guide section is also available at the end to provide you with further details on how to go about making a final choice. 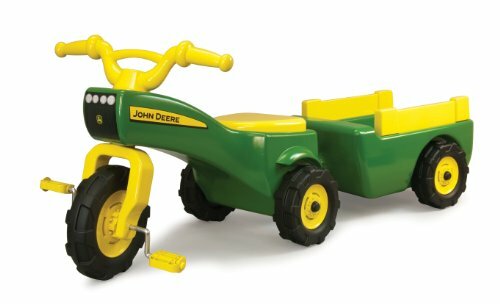 This 3-Wheel Trac John Deere toy has been constructed using resin materials that have been blow molded to prevent it from being easily damaged. Therefore, you can expect it to last your child for years to come. We liked how they’ve implemented resin tires that are over-sized. This ensures that children are able to ride around smoothly over rougher surfaces. Kids have also been loving how an electronic horn is available. They have a blast using this horn and it stimulates their audible learning senses. In addition to this, the hauling trailer that’s available can be easily removed and connected. As a result, children are able to use it in their imaginative play games to think with more creativity. 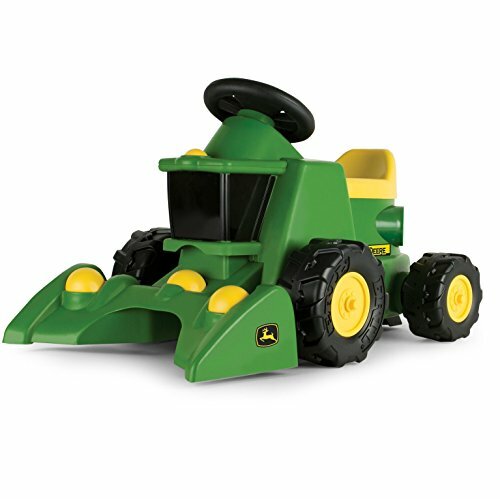 This is an awesome John Deere toy that features a working horn and removable haling trailer that encourages kids to play with a lot of creativity. Peg Perego’s John Deere Ground Force toddler Tractor comes with 2 speed settings available. The lowest speed lets kids travel at just over 2 mph and the highest one allows them to go up to a little more than 4 mph. So, you can be sure to choose the most appropriate speed setting depending on your child’s experience with these kinds of toys. There’s an accelerator pedal available as well as an automatic braking system that makes it super easy for kids to use. We also liked how the wheels that have been fitted allow children to ride across gravel, pavement, grass, or dirt without any issues. This inspires children to be more adventurous when playing outdoors. The 2 speed settings available with this one mean that kids who are beginners, and those who have played with these toys before, are able to use the mode that suits them best. The Sit ‘N Scoot Activity Tractor comes with a working horn that lets kids listen to “old McDonald” which is exciting and stimulates your child’s audible learning skills. Parents have been liking how there are volume control settings available as well. There’s a 3-in-1 design with this one that lets children either scoot themselves along, be pushed by someone else, or to push themselves along. This provides children with different ways of playing that encourages more active play. We were also impressed with how your can flip the seat to find a play set underneath. This includes 4 different farm animals which children can use to play with and be imaginative. They’re also given the chance to learn more about different animals. We liked how this one has a 3-in-1 design that lets kids play with it in different ways to be more active. The toy animals included are also awesome for your child’s creative thinking skills. 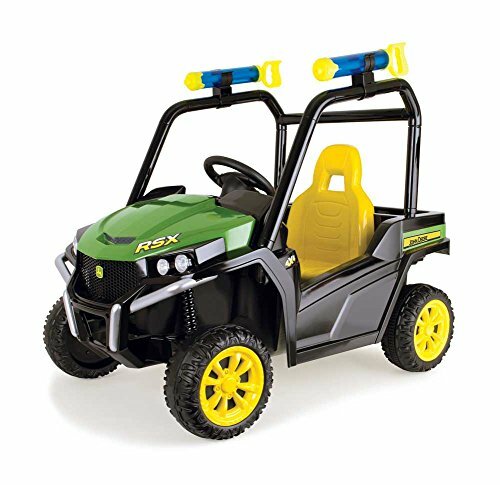 This Gator Xuv John Deere toy has been fitted with high-traction tires. They are incredibly effective at providing your child with stability while riding across different terrain which ensures that they can remain in control. We also liked how they’ve included seat belts to keep your child even safer. A cup holder has been included in the design too. Parents have been loving this feature as they’re able to keep their child hydrated, without having to disturb their playtime. The seat can also be easily adjusted to suit children of different sizes and heights. As a result, you can be sure that your child will be able to play for hours in comfort. There’s also a dump bed that has a tailgate that can be opened and kids love playing with it. 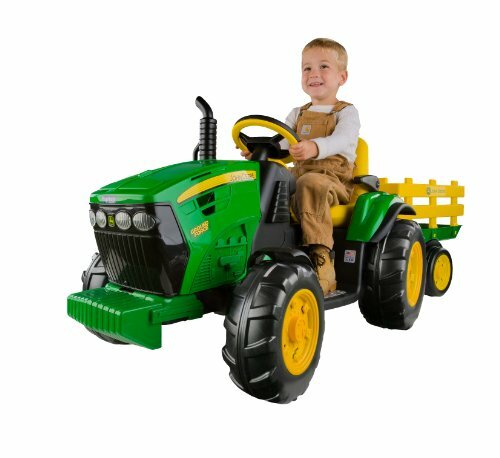 The seat belts and high-quality tires that are available with this John Deere toy allow children to play for hours and have a blast, while also being safe. The Peg Perego John Deere Dual Force Tractor comes with 2 speed settings. Kids who are beginners to these kinds of toys would be better off using the lower mode which lets them travel at up to 2.25 mph. They can then use the higher speed setting later on that allows them to go up to 4.5 mph. A reverse function is also available which can be handy. In addition to this, they’ve fitted an FM radio which kids love using. It makes the playing experience more realistic, which inspires them to play with more creativity. Furthermore, a flashing light feature is included as well. This makes the experience more exciting for kids and stimulates their visual learning senses. We also liked how they have fitted high-traction wheels as they provide children with a smooth and safe ride across rougher surfaces. 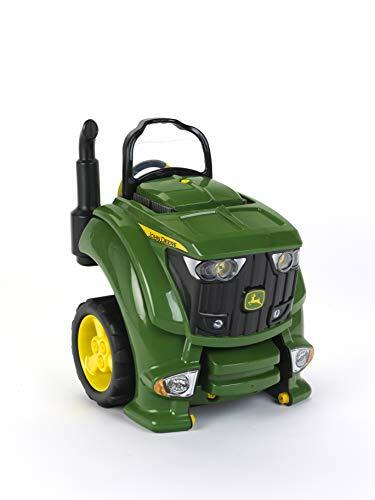 The FM radio and flashing light make this John Deere toy more realistic for kids to play with, which encourages them to be a lot more creative. With high-traction tires, children are also able to ride across trickier terrain safely. 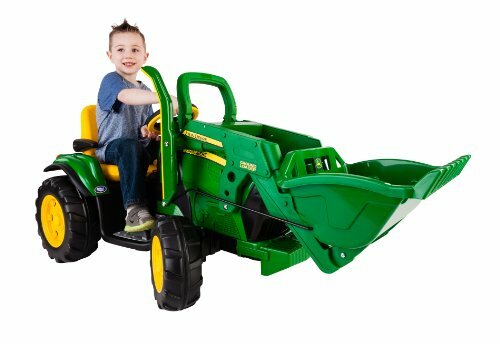 This Ground Loader John Deere Ride On toy by Peg Perego comes with some impressive working features that include a front loader. It works effectively to scoop, lift, and dump things which kids have been loving. They’re able to have total control which is awesome for their motor skills and coordination. An accelerator pedal is available with automatic brakes which lets them be in control while being safe. There are high-traction wheels which mean that kids can play on pavement, gravel, dirt, or grass, and still be able to have control. The seat can also be adjusted to make sure that your child is able to play comfortably for hours. We were impressed with how the front loader that’s available with this one works so well and allows kids to have complete control over it. It encourages them to play with a lot more imagination! 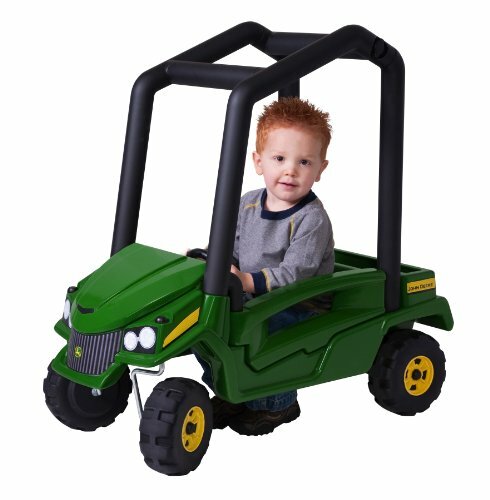 This is another awesome Front Loader John Deere toy by Peg Perego that allows kids to use the front loader to pick things up and dump them while being in control from the driver’s seat. Their motor skills and hand-eye coordination are able to develop well as a result. We liked how this one has a chain drive that means kids have to pedal it to move around. It encourages them to be more active and get more exercise while having a blast. The wheels that have been fitted are of a high-quality. Therefore, kids can use it on grass, pavement, gravel, and dirt. Not to mention, the bucket seat can be adjusted to keep your child comfortable while they play. The pedal feature that’s available with this one is awesome for helping kids to find a more exciting way of exercising and being outdoors more often. 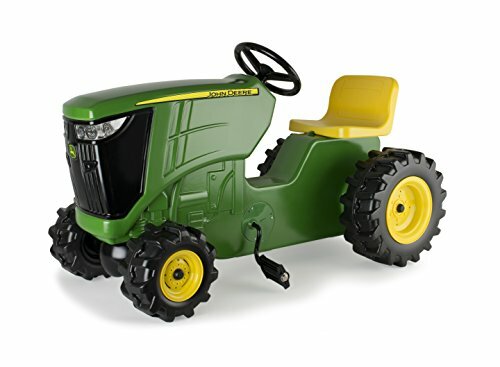 The Peg Perego John Deere Farm Tractor and Trailer has a bicycle chain drive which provides kids with the chance to pedal around on the toy with ease. As a result, they’re encouraged to play more actively and outdoors. We liked how they’ve fitted large high-quality wheels to this one. They allow kids to ride around on different surfaces smoothly and safely. It can also be an effective way to encourages them to explore the outdoors more. The bucket seat that’s available can be easily adjusted to keep your child comfortable. Furthermore, the trailer and design of this tractor is realistic, which can inspire kids to use it to play in more creative ways. The pedal feature and large tires mean that kids are able to have fun riding around outdoors with smoothness which encourages them to play more actively. This Pick N Pop Combine allows kids to scoot themselves along by using their legs which makes it an effective toy for encouraging your child to be more active. However, we also liked how it comes with a bar at the back that parents can use to push their child. As a result, it can be a great way for your and your child to spend some quality time together. Children have been loving how it comes with 2 songs for them to listen to while playing. It’s exciting and awesome for improving their audible learning senses. In addition to this, there is a ball pick and drop feature. Kids have a lot of fun playing with this feature and being entertained for a long time. We liked how this one encourages kids to play more actively by scooting themselves around – as well as how parents can use the bar to push their child along to spend quality time together. This Get Around Gator has dual opening doors which is a fantastic feature that makes it super easy for children to get in and out of. Kids have also been loving how there’s a working horn available and it’s great for their audible learning skills. We also liked how they’ve included clicker keys as they make the Gator more realistic for kids, which inspires them to play with more creativity. They can also use this horn as a way to let people know that they’re coming when they’re outdoors. The accelerator that’s available lets kids have total control over the Gator. This can be a lot of fun which can encourage children to play outdoors more often. But it also comes with a handle that parents can use to push the Gator along too. 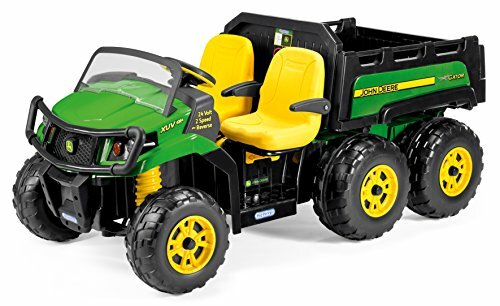 This is a great John Deere Gator toy that encourages children to play outdoors more often and be more creative due to the realistic design features. This John Deere Mini Power Loader by Peg Perego allows kids to play safely both indoors and outdoors, which means you can keep your child entertained, regardless of the weather. It can travel at a top speed of just over 2 mph. Therefore, it provides children with a safe speed limit which they can still have fun with. There’s an accelerator available that kids can use by using their foot to control the speed. We liked how there’s an automatic braking system too. This makes it easier and safer for children to play with. Moreover, we were impressed with how it can be used on grass surfaces, dirt, and flat surfaces. It’s great for encouraging kids to be more adventurous. The front dump bucket is also a lot of fun to play with and inspires creative thinking. The dump bucket encourages children to play with a lot of imagination, which is great for their creative thinking. Moreover, they can explore more because the ride on toy can handle different surfaces. 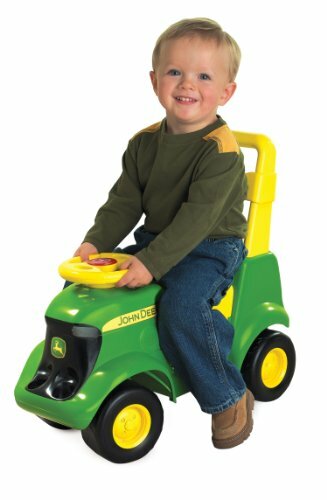 TOMY’s John Deere Sit-N-Scoot Tractor Toy has a wide wheelbase that works effectively to keep your child stable and safe. There’s also a foot accelerator which is super easy for children to use and control the speed. They’ve created this tractor toy with a lightweight design as well. This is effective at ensuring that children are able to have an easy time with maneuvering the toy. It’s great for outdoor play too which is awesome if you’ve been struggling to get your child to be outdoors more often. We were impressed with how they’ve made it look incredibly realistic as it makes the playing experience more realistic for kids. As a result, they’re encouraged to play with more creativity. The wide wheelbase design provides kids with plenty of stability and the lightweight design makes it easier for them to control the toy. Therefore, they’re able to focus on having fun and being creative. This TOMY John Deere Pedal Tractor and Wagon toy set provides children with different things to play with and be entertained for a long time. They have a blast using the wagon to play with imaginatively. We were impressed with how they’ve made this one look very realistic. This makes the playing experience better for kids as they’re able to use their creative thinking skills well. They have an absolute blast putting various items in the wagon and hauling them around. It encourages kids to play outdoors more often too, which is always a great thing. Children love using the wagon to transport different items around and play with a lot of creativity. This Battery Operated Toy is powered by a rechargeable 6V battery that allows kids to travel at up to 2.5 mph. They’re able to go backwards and forwards at safe speeds, while still being able tot have fun. We liked how they’ve included 2 detachable water bazookas too. Children have an absolute blast using these to play with one another outdoors. It can be an effective way to encourage your child to play with others and improve their social skills. In addition to this, we were impressed with how there are light and sound effects available. These make the playing experience more realistic and exciting which is great for your child’s creative thinking skills. It also stimulates their audible and visual learning senses. The water bazookas are a unique addition that encourage kids to play in groups and improve their social skills. We also liked the light and sound effects as they make for a more realistic experience which inspires creative thinking. 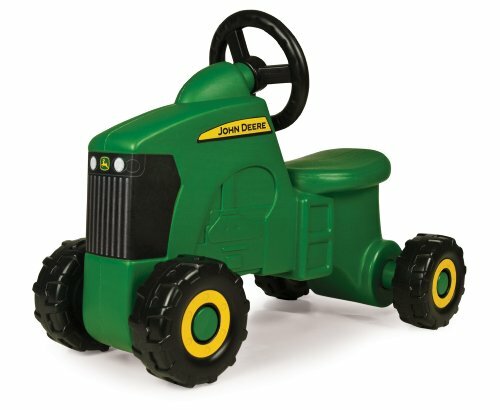 This John Deere Pedal Tractor by TOMY has an adjustable seat that keeps your child comfortable while they play for hours on end. The adjustable feature also means that it can grow with your child to last them for years of play. The pedals that are available are awesome for encouraging children to be more active while playing. As a result, you can expect them to be outdoors and exercising more because of how much fun they’re having. We liked how the steering wheel is easy to use to provide kids with total control. Furthermore, the design of this pedal tractor is realistic which encourages kids to play more creatively with it. The pedal feature is excellent for providing your child with a fun way to exercise more often. Moreover, the design and controls make it super exciting and encourage kids to be more creative. 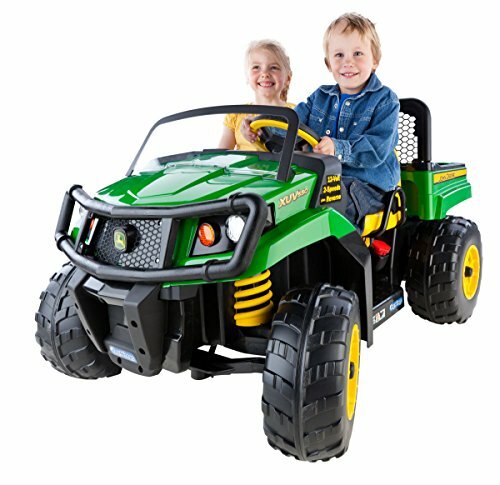 The John Deere Gator XUV comes with 2 speed settings that let kids travel between 2.5 and 5 mph. You can choose the lower mode for kids who are beginners to these kinds of toys to ensure that they can get to grips with controlling it properly. Once they’re more experienced, they can have even more fun using the higher speed mode. We also liked how they’ve implemented a 4-wheel drive feature along with 6 high-traction wheels. These features work effectively to provide kids with an incredibly smooth ride across all kinds of terrain. In addition to this, there’s an extra large dump bed that comes with a tailgate for children to play with too. We were impressed with how this one comes with 6 high-traction wheels and a 4-wheel drive system as it works effectively to provide kids with a smooth and safe ride on rougher terrain. This John Deere Tractor Engine toy has a wide range of different parts that can be repaired and put together. These include pretend nuts, bolts, a radiator grill, spark plugs, and more. While assembling all of these pieces, children are able to develop their hand-eye coordination and motor skills. Not to mention, if they get stuck, they’ll be able to use their problem-solving abilities. All of the parts have been made with high-quality materials, which means you can be sure that they will last your child for years of play. We were impressed with how there are working headlights and horn, as well as realistic startup sounds. These work effectively to make the experience more realistic for kids, which is awesome for encouraging them to play with more creativity. Kids are left with so many different parts to put together and have fun with that you can feel confident in knowing that they’ll be entertained for hours on end. During the process of assembling the engine toy, your child’s motor skills and hand-eye coordination are able to improve well. Though not officially a John Deer Toy, this Peg Perego Case IH Magnum Tractor is available in an awesome pink color that girls have been loving. It comes with 2 sped settings available that allows kids to travel between just over 2 and 4 mph. There’s also a reverse function available that can come in handy. We also liked how parents are able to keep their kids safe by choosing which speed they can travel at. So, if your child is a beginner, you can have them play with the lower speed setting until they gain more experience. The accelerator pedal is super easy for children to use. Moreover, there’s an automatic braking system that works effectively to keep kids safe while riding around. A stake-side trailer is also included which allows kids to put things inside and transport them around. They have a blast doing this and it’s great for their creative thinking skills. The 2 speed settings ensures that parents can select the one that’s most appropriate for their kids. We also liked how they’ve included a trailer as it lets kids ride around with different items to play with a lot of creativity. 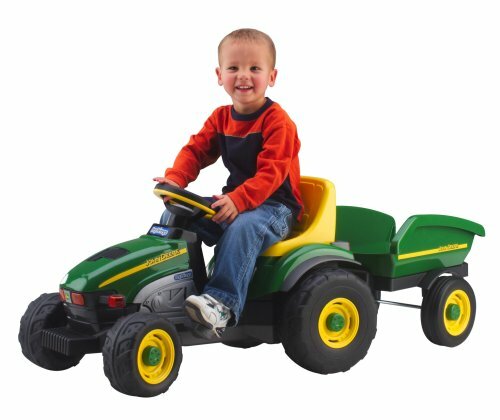 So, that was our review on what some of the best John Deere ride on toys for kids have to offer. Hopefully, you can go ahead and pick the one that you think your child would enjoy playing with the most. However, if you’re still feeling a little unsure, don’t worry. We’ve put together this buyers guide section to provide you with some additional information. By the end, you’ll be feeling more confident about which one to pick. After reading through the review above, you will have noticed that there are a number of different brands that manufacture John Deere toys. If you were interested to learn more about these top brands, take a look at the section below. Peg Perego has been in the business for over 60 years and have become one of the leading companies that manufactures toys for children. They started off with car seats and strollers, but have now expanded their range to toys that children have been having a ton of fun with. Power Wheels is a fantastic brand that manufactures electric powered ride on cars for kids that are powered by rechargeable batteries. They allow kids to have a blast riding around for hours on end and they have a wide selection of designs available. These range from Jeeps and sports cars, to motorcycles and dune buggies. The realistic designs are excellent for encouraging kids to play with more imagination. TOMY is a well-known company that has been creating high-quality toys for kids all over the world. They make awesome toys that help children to have fun while learning crucial developmental skills. Their John Deere collection is one of their classic toy lines that kids have been having an absolute blast with. 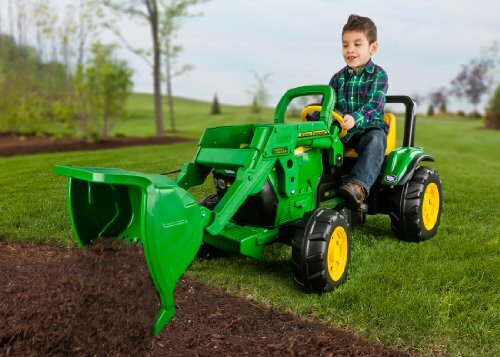 Now that you’ve gained a better idea of what the best John Deere toys have to offer, as well as what some of the top brands are, you can begin narrowing down your search to finding the best one for your child. Pedal tractors are a popular option because they require kids to pedal them and be more active. As a result, they feel encouraged to exercise and play outdoors more often, which is awesome for ensuring that they remain healthy. Gator toys are fun for kids who want to drive around by using a foot accelerator and steering wheel. They usually find the whole experience more realistic which inspires them to play more creatively. Wagons usually come as part of a set or they can be purchased separately and attached to the back of a John Deere toy. Children have a lot of fun using these wagons to haul items around and be more imaginative with how they play. The John Deere combine toys can be fun for kids to role play what they may have seen on farms with people using the real thing. As a result, it can encourage them to play with more creativity. John Deere tricycles can be an awesome option for children who want to pedal around outdoors and maintain balance with ease. They are excellent toys for younger kids who may be trying to learn how to ride a regular bicycle. 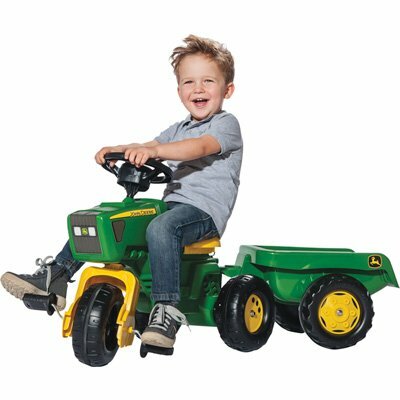 The engine toys that are available can be super fun add-ons to your child’s John Deere toy collection. They have a realistic design which helps kids to use them to play creatively. Furthermore, we like how they often make sound effects and have lights. These engine toys also involve kids assembling the various pieces. Therefore, they can be highly effective at developing your child’s hand-eye coordination, motor skills, and problem-solving abilities. There are so many different pieces available for kids to assemble and disassemble that you can leave them to play for endless hours. This can also be a great opportunity for them to play in small groups to work on the engine toy as a mini project and improve their social skills. John Deere trucks can be fun for children who want to pretend to drive trucks. Due to the realistic design that they have, kids are able to have fun playing with them in creative ways for hours on end. The mowers are another exciting option for kids as they’re able to use it in their pretend play games. They can role play how they may have seen their parents mowing the lawn, which is great for their creative thinking skills. While reading through this review, you will have noticed that all of the John Deere toys have the traditional yellow and green design. This is because these are the most popular options that have a realistic feature that kids have been loving. This can make it a little tricky when it comes to finding John Deere toys for girls and you’ll be glad to hear that we’ve included a rare pink option above and it is very highly rated. 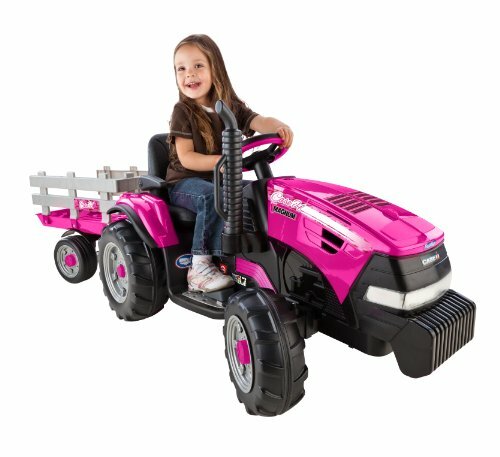 Having said that, girls have still been having a lot of fun with the traditionally designed John Deere toys but of course you can never go wrong with a pink option for girls. 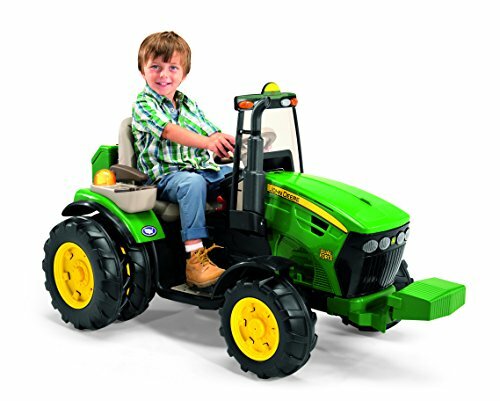 All of the information that you need to go ahead and pick the best John Deere toy for your child can be found right here. Be sure to read through all of the main features, pros, cons, age recommendations, and what makes each toy stand out. The buying guide section also ensures that you are equipped with everything you need to feel awesome about making a final decision.